"The problem: John West Australia sells 97 million cans of tuna every year, but because of their destructive fishing practices, another 10 million cans could be filled with sea turtles,sting-rays and dolphins inadvertently killed as by-catch. 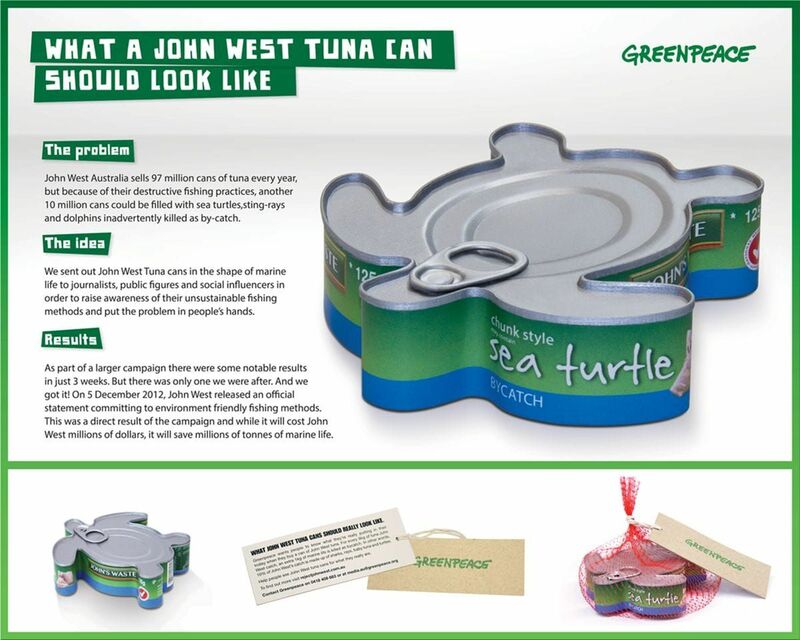 The idea: We sent out John West Tuna cans in the shape of marine life tojournalists, public figures and social influencers in order to raise awareness oftheir unsustainable fishing methods and put the problem in people's hands. The result: As part ofa larger campaign there were some notable results in just 3 weeks. But there was only one we were after. And we got it! On 5 December 2012, John West released an official statement committing to environment friendly fishing methods. This was a direct result ofthe campaign and while it will cost John West millions of dollars, it will save millions of tonnes of marine life."